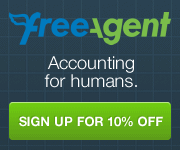 FreeAgent – Accounting for Freelancers & Small Businesses! We’re delighted to have FreeAgent on board as one of our top sponsors for PubHack #3! We’ve been using FreeAgent for about 2 years now and absolutely love it. Direct link to your bank account, so all transactions are automatically pulled in. Invoices, Estimates, Expenses, Contacts, Payroll, Banking and VAT. All these features help you smoothly keep track of your accounts. VAT & Tax – being UK based it’s great because FreeAgent will help take care of your VAT and Taxes. You get reminders on a timeline that let you know how much and when tax is due, so you know how much to put aside. You can take a look at their full features here. We’re really pleased to have these guys on board, and they will be showering you with FreeAgent goodies on the day, which will be going into your swag bags!